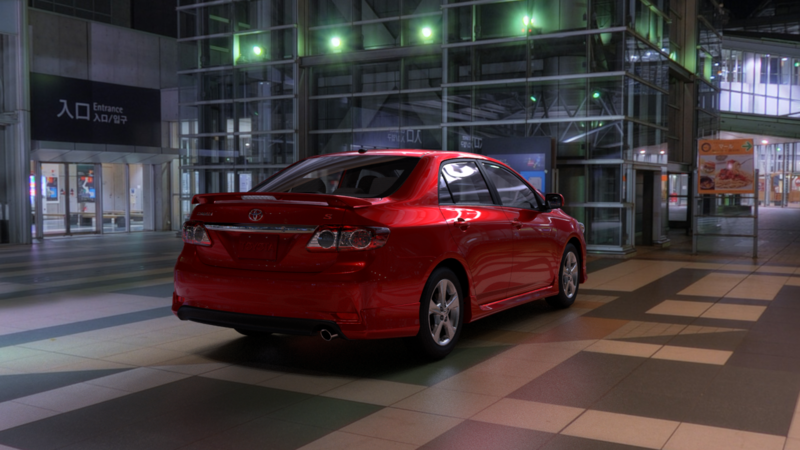 You’ll find updated PTex shaders directly from nVidia. is set, it will fix a lot of seams/gaps in your scene (which apparently does not have higher precision uv values at the seam, this is not a mental ray issue). The update is required only when using the Maya vector displacement mode, there are no other changes in the ptex shader. Keep an eye on the mental ray Twitter feed over the next few weeks as they give peeks into what’s coming in future versions of mental ray! You can also see it from here on the sidebar. 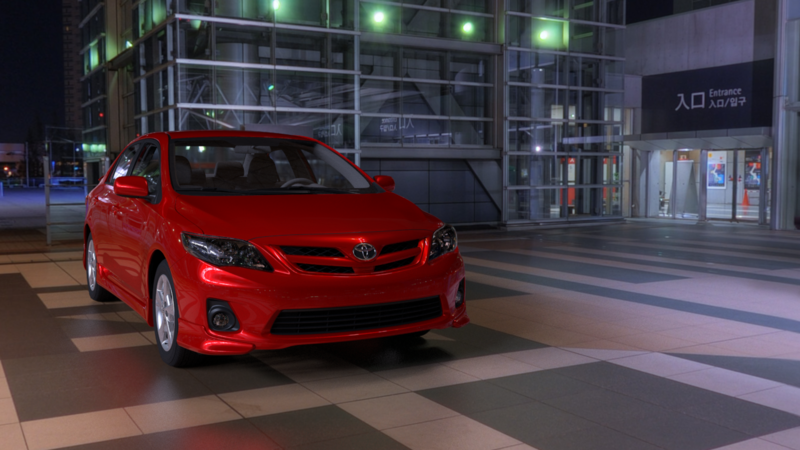 Introduced with mental ray 3.10 are new shaders called the user_ibl shaders. 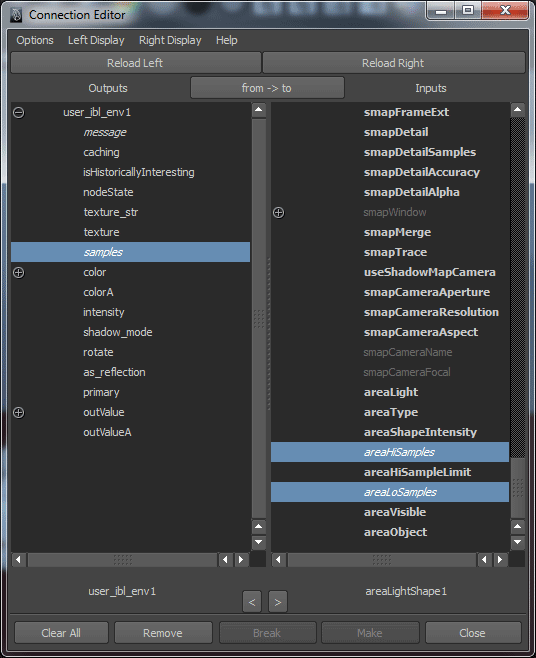 Inside this shader package are two new shaders with different usage scenarios. A more simplified usage than the Native IBL (mental ray), the user_ibl is a scene entity used for lighting a scene globally from an environment. Why would you use this instead of the Native IBL with string options? 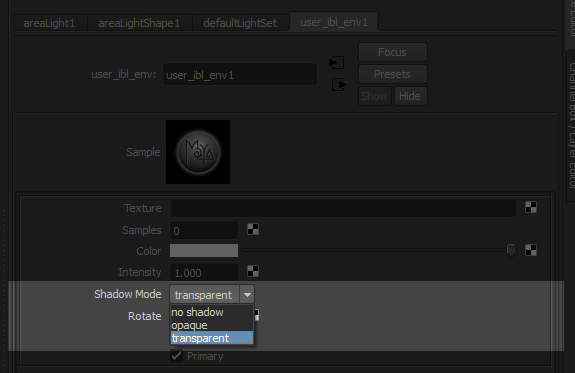 The user_ibl_env can be used as a shader in the scene. This means it can be operated and manipulated as a scene shader attached to an area light. It also improves on the importance sampling used by the Native IBL. The shader uses a connection to a texture. This means it has direct access to all of the detail found in an HDR image. The Native IBL will bake anything (including procedurals) attached as an environment. The user_ibl_env requires a texture to work correctly. If you are using a procedural like a ramp, it should be baked to a 32-bit image format like an HDR or EXR for rendering. Texture: This is where you attach a lat-long formatted HDR or similar high dynamic range texture to be used to light the scene. Samples: The samples used for lighting. This is the maximum number of samples used for lighting. More complex images or images with wide ranges of values may need more samples. As the importance of the sample becomes less (maybe it’s a few reflections or refractions later) the shader may call fewer than this number. Color: A scaling factor (RGB) for the colors in the texture. 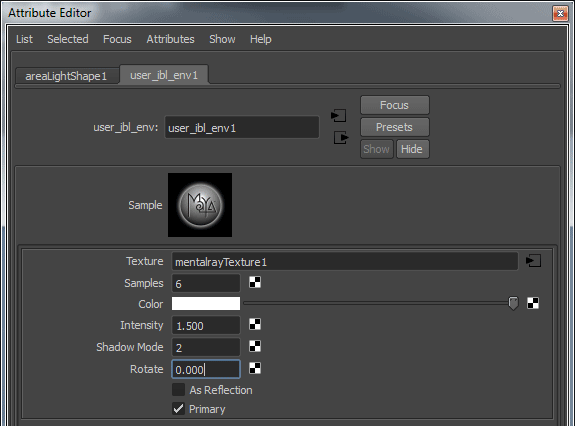 You can use this to manipulate the texture colors from the shader. Intensity: A standard multiplier for the lighting effect. 2 = twice a s bright. 3 = three times as bright, etc. integer "shadow_mode" default 2, #: enum "no shadow:opaque:transparent"
Added “enum” attribute to the .mi file. Rotate: This rotates the lat-long texture for placement. This is measured in degrees. As Reflection: Was the image being used for lighting shot through a reflection (mirror ball)? This will reverse the image to correctly integrate objects. How do you use this shader correctly? There are some steps to correctly use this shader inside Maya. We’ll look at them here step by step. 1. 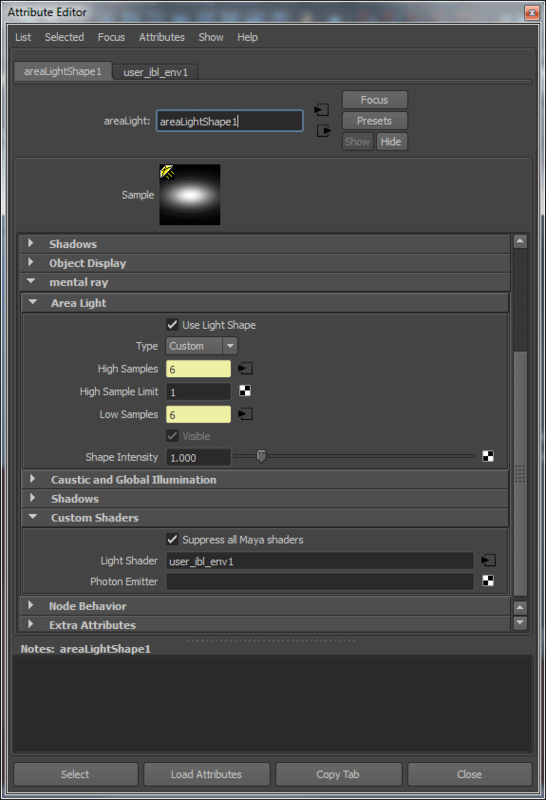 Create an area light in Maya. Its position and size do not matter. Under the mental ray rollout select Use Light Shape. 2. Under the mental ray ->area light rollout, Set the area light to ‘visible’. If you try to render your scene now, it won’t light as an environment. 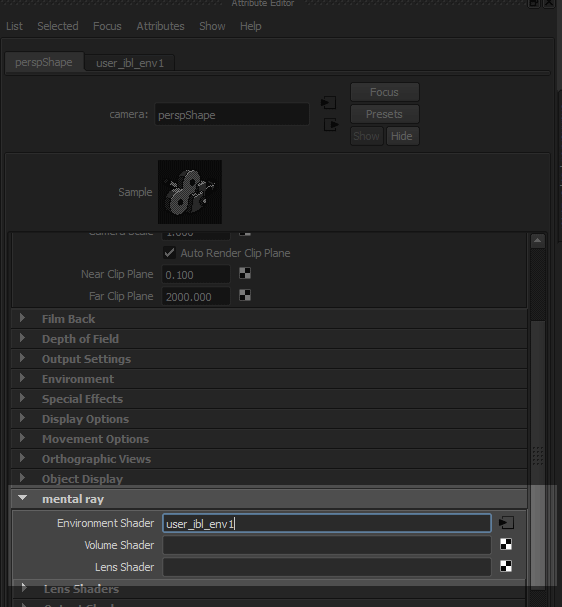 You still need to attach this shader to the Environment connection on the camera under the mental ray rollout. Additional Notes on this connection: You can still use ray switches and the mia_envblur shader here and attach the user_ibl_env to them. Keep in mind you may need to use a large resolution setting in the mia_envblur shader to preserve detail in reflections. Lastly, and very important: you must use the string option for Light Relative Scale for this shader to correctly scale the light for non-BSDF or older (legacy) shaders. This value is 1/pi. This is added in the miDefaultOptions. Now render with Unified Sampling. The following image was rendered using a backplate and HDR from: HDR Labs. In these images I did not use indirect lighting. If you do use it in such a scene, you can decrease the quality by quite a lot. Maybe 16 or 32 rays (or around there) for Final Gather. Insufficient samples for the user_ibl will show as grain in the image. In motion, slight grain won’t be noticed, don’t over-tune your scene. Avoid using any shader where it forces a specular (direct reflection) calculation from these lights. It will cause noise and increase render time. Do not defeat the importance sampling mechanism by making the High and Low Samples of the area light different than the user_ibl shader. Let it do the work for you.